Healthmaster, Inc. was founded in December 1989 to develop and market a database management product to automate the school health office and enable schools to efficiently record and access the immunization and health histories of their student population. Working with school nurses, special education health services providers, mental & behavioral health providers, and Medicaid coordinators throughout the country, Healthmaster has materially enhanced its software since its inception to provide extremely secure, web-based, hosted, state-of-the-art software, and services to address their needs, as well as those of other healthcare providers, school districts, county and state health departments, and other governmental agencies. 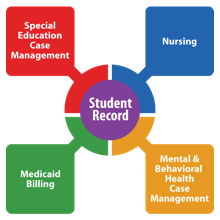 HealthOffice® Anywhere software is the industry leader for creating, scheduling, documenting, reporting, tracking, and analyzing student health data while providing the ability to integrate and pre-audit all of the information necessary to maximize the school district&apos;s Medicaid billing revenue. Healthmaster is one of the largest software companies in the U.S. dedicated solely to providing secure, hosted, School Nursing electronic medical record (EHR) software, Special Education IEP case management, Mental & Behavioral Health case management, Risk Management, Advanced Reporting, and integrated Medicaid claim processing to public and private school districts throughout the country.